Recently I looked at the back of a hot dog package and I regret it. Not because of the ingredients list. The nutrition facts. Think about this. One pound of pork has 95g of protein. One pound of chicken breast contains 136g of protein. One pound of cheap hot dogs (which are composed of pork and chicken) contains just 32g of protein. And yet, they aren’t much cheaper than chicken breast! So if a hot dog has 1/4 the protein of chicken, shouldn’t hot dogs cost 1/4 the price? That’s what I thought. Hot dogs are supposed to be a cheap source of meat. But I can buy a pound of chicken at $2.50/lb and a pound of hot dogs at $1.50/lb at Walmart. Let’s try a new metric – dollars per 100g of protein. For chicken, 100g of protein costs $1.84. Hot dogs? $4.18. And that’s for off-brand hot dogs. Oscar Mayer Classics are $5.37 for 100g of protein. Based on this metric, hot dogs are expensive. A nice pack of hot dogs has a $/gram protein price comparable to beef chuck or blade steak. You’re paying a premium to eat a mixture of meat scraps, corn syrup, and water compressed into a little weiner shape. The value of meat comes from many factors, like protein content, taste, and convenience. So comparing foods just based on one metric – cost per ounce, cost per gram of protein, cost per calorie, taste, convenience, perishability – isn’t enough. It’s like judging a car solely on its gas mileage. Or a person based on their attractiveness from 1 to 10. There isn’t one number that compares food. White rice, for example, is the cheapest source at $1.28/100g of protein. However every gram of protein from white rice comes with 11g of carbs. Whereas canned tuna maxes the chart at $10.00/100g protein, yet every gram of protein comes with 0g of carbs. So these data and conclusions are only a small insight in a multifaceted problem. In table above, I’ve added data about cost per calorie and Fat/Carb/Protein ratio. This changes how we interpret the data. Peanut butter, which is cheap source of protein, has a Fat/Carb/Protein ratio of 16/71/14 (ignoring the rounding errors). Every gram of protein comes with 5 grams of fat. Or you could say every calorie of protein has 11 calories of fat. In the table below, I’ve added more data about fat, carbs, and calories. Although the sample size is small, it’s one of the most complete cost analysis of macronutrients and calories available on the internet. If you know of similar work, let me know in the comments below. Canned tuna, which contains 0 carbs and almost 0 fat, is utilitarian. It’s protein in a can. Perhaps it’s value lies in the absence of fat and carbs. At $4.96/100g protein, cheap tuna is the 4th most expensive source of protein out of 21 foods I analyzed. And a nice can of tuna, like Wild Planet, tops the chart out at a whopping $10/100g of protein!! You’ll find most websites who write about cheap sources of protein recommend canned tuna. In fact, the first three Google results for “cheap sources of protein” all recommended canned tuna – here, here, and here. These lists are wrong, very wrong. Most claim a 5oz can has 40g of protein. Where are they finding 5oz cans of tuna with 40g of protein? 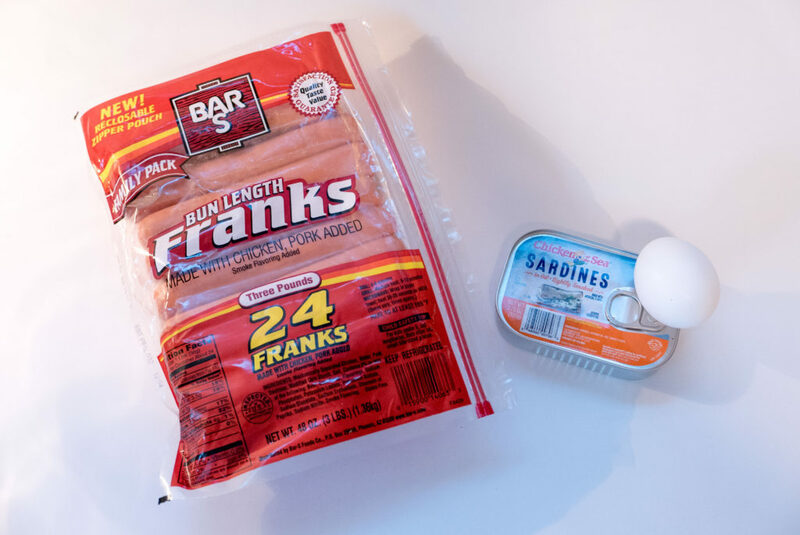 Cheap brands like Starkist and Chicken of the Sea have about 20g of protein in a 5oz can. Nice brands like Wild Planet and Safe Catch get a maximum of 35g of protein into a 5oz can. I have a feeling these articles are written by looking at similar articles and blindly copying their items. Tuna is a great food and a great source of protein, but it’s expensive. Our weightlifting and frugal friends reading these lists are being misinformed. Side note – there are a select few people out there who did their own research. Particularly Stacey Krawczyk, who shows that salmon is cheaper than hot dogs. Most of these food prices come from my local Walmart. I live in a small Midwest town, so the cost of food is quite cheap. You can probably scale these numbers up if you live in a bigger city. Additionally, many of these prices fluctuate significantly – fresh meat and eggs are often in turmoil or on sale. Maybe your grocery store sells milk and eggs for a premium. However, these data are accurate enough to refute hot dogs and tuna as cheap protein. You can download my CSV or XLSX. If there is food you’d like to see on these tables, errors in my calculations, or other feedback, leave a comment below!